.8. Percentage of the rental homes that were supposed to be repaired and occupied by August 2008 which were actually completed and occupied – a total of 82 finished out of 10,000 projected. 11. Percent of families who have returned to live in Lower 9th Ward. 17. Percent increase in wages in the hotel and food industry since before Katrina. 32. Percentage of the city’s neighborhoods that have fewer than half as many households as they did before Katrina. 40. Percent fewer special education students attending publicly funded privately run charter schools than traditional public schools. 46. Percent increase in rents in New Orleans since Katrina. 56. Percent fewer inpatient psychiatric beds than before Katrina. 80. Percent fewer public transportation buses now than pre-Katrina. 1,250. 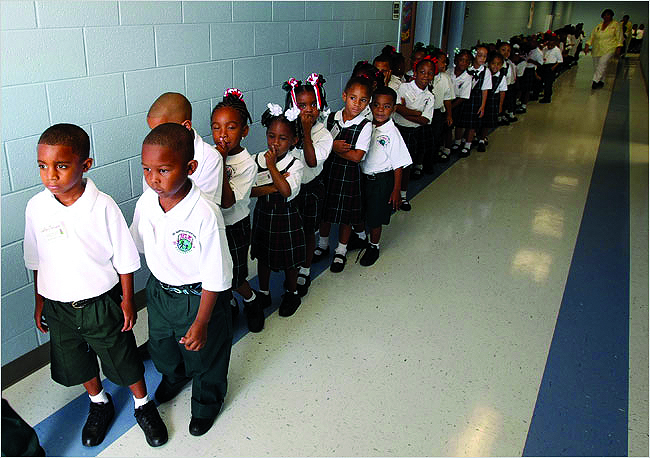 Number of publicly financed vouchers for children to attend private schools in New Orleans in program’s first year. 320 million. The number of trees destroyed in Louisiana and Mississippi by Katrina. Bill Quigley is a human rights lawyer, a law professor at Loyola University New Orleans and author of the forthcoming book, “Storms Still Raging: Katrina, New Orleans and Social Justice.” A version with all sources included is available. Bill’s email is quigley77@gmail.com. For more information, see the Greater New Orleans Community Data Center at www.gnocdc.org and Policy Link at www.policylink.org. nice job. keep it on.